Who doesn’t have a story gathering dust in a drawer? I recently pulled one out that I’d never created a dummy for, let alone submitted. The obstacle? 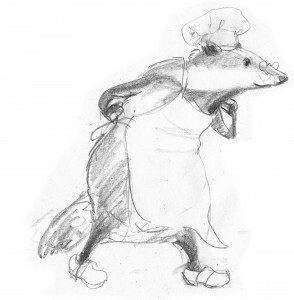 Though I know, deep down, that my main character wants to be an animal – a badger, to be precise – I’m inexperienced at creating critters that convincingly combine human and animal characteristics. Inspired by Dan Santat’s talk at the SCBWI Western Washington Conference in 2011, I decided to give anthropomorphism a whirl. Cribbing his approach, I first explored character concepts from imagination; then drew from reference; and finally blended the two in a character who has real Character. 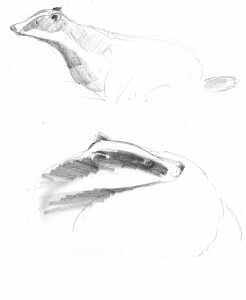 My sketches from reference made lovely wildlife drawings, but lacked individuality. Progress! 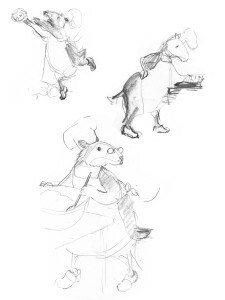 This guy feels like my character: a slightly anxious fellow whose limbs are flexible enough to gesture, but whose body and head feel truly badger-like. A true Character who can hold his own as I dummy up this book and send it out into the world.